In many houses, the kitchen is the one place where everyone comes together. As such, when remodeling your kitchen, you should invest wisely in it to ensure that it is as pleasant, comfortable and spacious as you can make it. The examples below highlight some of the latest trends in many kitchens. Many kitchens today are large with an ‘open concept’ where the kitchen is no longer confined to four walls. In the process, people are asking for larger islands with cabinets and functional drawer inserts already installed. As such, the trend is to do away with wall cabinets altogether. Where cabinets are used, designers are inclined to opt for dark, rich and glossy colors like deep blue, sage green, yellow, chocolate brown, red and, in particular, black. Natural veining – this tends to hide stains and grime better than others. Ochre veining – this echoes the rest of your kitchen if you are using bright paints and tiles. 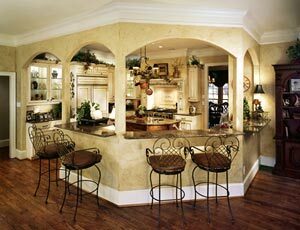 Granite – this goes well with kitchen cabinets that have a dark, rich and glossy color. Built-in drain – this means that the drain board is built into the side of the sink with drain lines that are designed to run into the sink. Water filters – this allows you to obtain clean, filtered water straight from the tap. ‘Undermount kitchen sinks’ – this means that your sink is recessed into your countertop. As such, it takes up less space, makes your countertop look seamless and no dirt will gather around the rim of your kitchen sink. An island has become the focal point and icon of a modern kitchen. While you are busy cooking and cleaning, an island offers a place for your family and friends to socialize while keeping you company. Yet, they will not be in your way as you prepare your meals. Nothing says trendy more than having kitchen appliances – from refrigerators (with water and ice dispensers on the outside door) and cookers to ovens and dishwashers – that are both convenient and energy efficient. In line with the use of modern color schemes of rich and dark colors, manufacturers are beginning to provide appliances with a glossy black appearance. Keep in mind all of the above when remodeling your kitchen. No doubt, when your remodeled kitchen is ready – from cabinets that have rich and glossy colors to stone countertops – you’ll have one that fits perfectly with your modern lifestyle.